Klout, PeerIndex, Kred, and even Empire Avenue [response from Empire Avenue] need to go away. These metrics-applications rely on our need to know our “value” and will only continue to perpetuate the dilution of online engagement. This is an open call to the people that use these services, or are simply indexed by them, to opt-out and delete your presence on Klout, Kred, and PeerIndex. Here’s how the Internet works, “If you post it, make it, and/or share it they will come.” It’s that easy. If whatever you make isn’t good or great, they won’t stay. So in order to have great results online you have to actually do something good or great. Defining “Good” and “Great” are completely subjective to the audience you’re trying to reach, but for starters, the Internet should be filled with interesting, useful, intelligent, creative, helpful, informative, entertaining, or fun things. Start there, and you’ll probably come out ahead. If that’s too many options, pick one, such as “Informative”, and you have yourself a great foundation for building an online audience. The inverted logic loop of Klout works like this, “If you use a social network and connect to the right people, and they reshare what you share, and so on, we’ll give you a biscuit.” So, basically, all you have to do is share stuff, you no longer have to make stuff, in fact, running your own site, self-hosted blog, or building an app in the app-store, really does nothing for you. What you actually need to do, according to Klout, is stop everything you’re actually doing. To get the most out of Klout, concentrate on micromanaging all your followers and connections to ensure you have a high reshare/replies ratio. 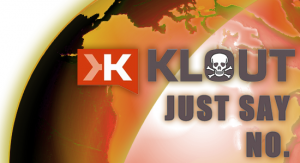 Ignore everything outside of the sites Klout supports. If you’re diligent enough at not doing anything productive Klout will reward you with a treat! Klout, essentially, makes no sense at all because if what you post is getting attention and people are talking about it, you already have results, those results are called “Pageviews” or “Revenue”. In no way, whatsoever, do you actually need Klout if what you’re doing actually works… unless all you’re doing is tweeting, posting to Facebook, or checking in on Foursquare. By definition, tweeting well, using Facebook to the fullest, or being the mayor of whatever on Foursquare doesn’t hold any actual value, unless you own Facebook, Twitter, or Foursquare. This is, at the very least, embarrassing. Have you ever heard of Maslow’s Hierachy of Needs? Now, there are certainly far better suited psychology experiments out there that can explain why waving a dog-treat in front of people to get them to do things will work, but let’s just focus on the need to feel like you’ve achieved something. When you do X and in return you get Y, you feel a sense of accomplishment, your ego’s been stroked, and you come out feeling like a winner. Only problem is, with Klout, doing X means you sent a tweet and it got retweeted, and the Y in return is going from 49 Klout to 50! Since Klout knows this isn’t really a sustainable business, they’ve done a clever job at making partnerships with powerful allies, like Audi, Microsoft, and MooCards to give you free stuff because you get comments on your Facebook posts. Sounds great, right? That means all you have to do is go buck-wild and crazy on top of the social network mechanical bull to make ends meet! You can score phones, get weeks with new cars, and go to parties; you’ll be the talk of the Klout-town, all for just checking in to your toilet whenever you venture to the restroom. The result of Klout is pretty simple: Noise. Noise is that thing on social networks that doesn’t do a darn thing for anyone except let them see yet another status update to ignore from someone that shares so much junk no one really cares to read it 99.98% of the time. I don’t have actual metrics, but from a random sampling taken over the past ten months on my own posts reshared by “Klout influencers”, I found the click-through-rate was around .02% from tweets. That’s about 5 times lower than an ad unit, but it’s free! Well, if you count your time as worthless anyway. Klout needs to vanish. The only way for it to vanish is if people that have it flat out jump ship and never look back. The only way to dethrone Klout from having the gall to claim authority in measuring the value of your life online is to simply take back the Internet. This isn’t even getting into the privacy concerns or speculations of their fraudulent score fixing to juggle their own site’s engagement and feeling of importance. This post is about what’s good for the Internet, better for those that use it, and about how to get back to the basics of a pre-Klout existence online. It was better before Klout, it will be better after they’re gone. For those of you that are worried about your online credibility not being on display for future employers? Spruce up your LinkedIn profile and brag better, ask for a few endorsements – what actual people say about what you’ve done is far better than some mysterious number that can score you some false sense of accomplishment. As an added bonus: If you’re a business and you need a metric, pull “Time on Site”, there’s some real engagement that actually holds value to what you’re trying to accomplish.